Are you a fan of photo books? We just love them. They are so easy to store. So much easier than looking at single photos. I so wish that these were available when my kids were born. I can’t turn back time, so I started to make photo books when I first learned of them. Now I have years and years of photos to scan before I can get those into photo books – unfortunately – I’m not sure that will ever happen – I have way too many. Don’t let that to happen to you. Get those photos into books now. Get them off of Facebook – your computer – CD’s – flash drives – wherever you have them stored! Take advantage of this special offer from Collage.com. 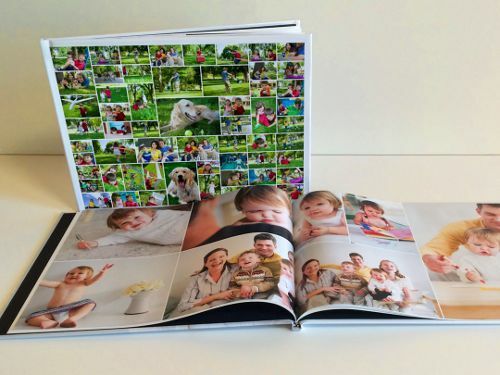 Create a professional hardcover photo book with a single click using Collage.com’s One-Click Photo Book. Select photos of any size from Facebook, Instagram, Flickr, or your computer and they will instantly suggest a clean, professional layout that you can further customize. All you need to do to receive this huge savings of 51% off a 20-page 11.5″x8″ Hardcover Photo Book From Collage.com is to click here. Shipping is included with this particular offer. See the Terms & Conditions on the site where other charges may apply (extra pages etc.). Limit of five (5).